Metal-detecting between 2003 and 2012 recovered an Iron Age, Roman and medieval coins as well as Bronze Age, Late Iron Age/Roman, Roman, medieval and post-medieval metal objects. The metal finds include Bronze Age casting waste; a Late Iron Age to Roman copper alloy penannular brooch; a Roman brooch; a medieval buckle and key and a post-medieval buckle and part of a knife. 1 ?Bronze Age casting waste scrap. 2 medieval coins and 1 key. Coins identified by A. Marsden (NLA) and other objects by S. Ashley (NLA). See lists in file. A. Rogerson (NLA), 21 July 2003. Updated by J. Page (HES), 24 March 2014. A. Rogerson (NLA), 16 July 2004. 2 medieval coins, 1 buckle fragment and 1 casket key. A. Rogerson (NLA), 18 July 2005. 1 Roman brooch (Hod Hill type, see S1). Identified by A. Rogerson (NLA). See lists in file. A. Rogerson (NLA), 15 July 2006. Before 15 October 2012. Metal-detecting. Late Iron Age to Roman copper alloy penannular brooch. <S1> Illustration: Gibbons, J.. 2006. 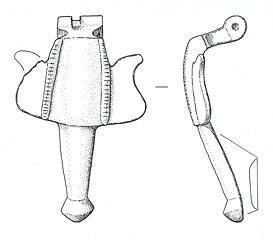 Drawing of a Roman hod hill brooch.. Film. 2:1.